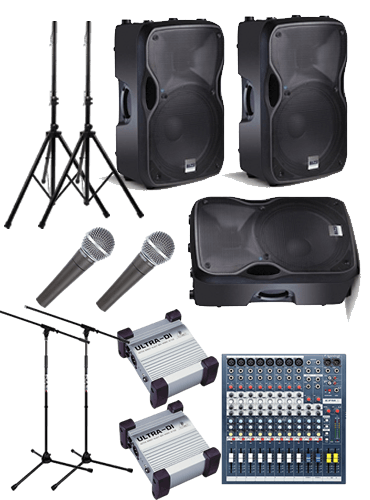 This package is ideally suited to acoustic acts, or where a vocal only PA is required. Consists of a basic set up with two microphones / two DI boxes for keyboards / guitars and one monitor for fold-back. The mixing desk has a built in FX engine for reverb / delay if needed. Small acoustic groups where high output volume and heavy bass isn’t required. Ideal for acoustic soloists / duos. A great plug and play solution for most bands. Great for function bands that need a decent sounding, simple to use set up. Mic set up can be customised to your specific requirements for no additional charge. Simple to use analogue desk means set up is very straight forward. Small bands where a plug and play solution is required. Capable for audiences up to around 150 people. Can be used to mic drums / bass / guitars / keyboards / vocals as well as other instruments. 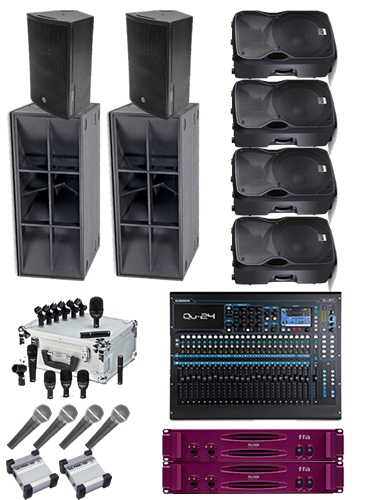 This package is great for bands who are using experienced engineers, as the digital desk gives them the flexibility to completely customise their sound. Enough power for an audience up to 150 outdoors or 250 indoors. Small bands where a more advance solution is required. Capable for audiences up to around 150 people outdoors / 250 indoors. Can be used to mic drums / bass / guitars / keyboards / vocals as well as other instruments. Controlled via an iPad mixing app (QU-PAD). 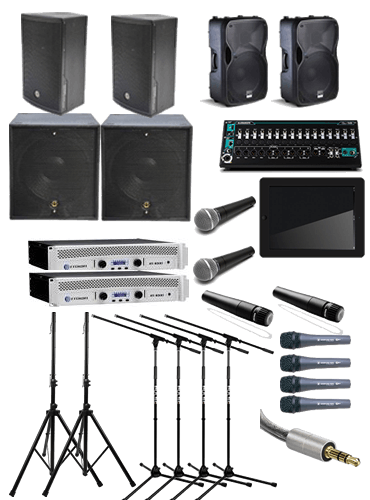 Capable of making enough noise for up to 600 people outdoors, the large band package packs some serious punch in both volume and clarity. Includes a QU24 desk for FOH mixing, collection of mics, 4 monitors as standard, 9kW sound system. A large band set up with up to 24 inputs, up to 9 mix outputs, 4 FX engines, plus a host of other features. 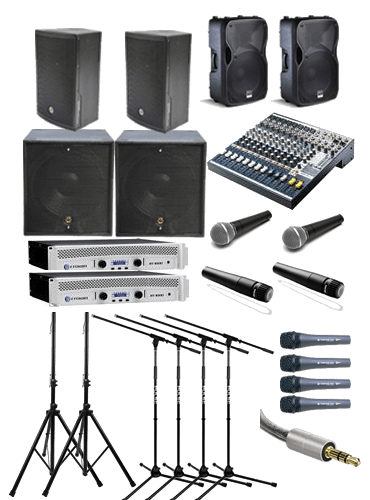 Great for serious bands who want a great sound for audiences up to 600 people outdoors and 750 indoors.